You may think the Poodle is all style, but the “Poodle clip” that makes the appearance of the Poodle famous was actually designed by hunters to make the dogs more aerodynamic in the water! The Poodle most likely came from Germany, where it was first known as the Pudelhund. Pudel means "to splash about" in German, and the world hund in German means "dog." As the “Splashing Dog,” the Poodle was used as a water retriever by hunters and still is today. The Poodle’s curly, moisture-resistant coat makes it a great swimming breed. The Poodle was bred in three sizes: Standard, Miniature, and Toy. The Standard Poodle is the oldest of the three breeds, and the Toy Poodle was actually developed in eighteenth century England. Today, the Poodle is the eighth most popular breed of dog in the United States. The three sizes of Poodle mean that there’s something for everyone. The Standard Poodle can reach about 15 inches in height (to the shoulders) and 45-70 pounds; the Miniature Poodle averages 11-15 inches in height and 15-17 pounds; and the Toy Poodle averages 10 inches in height and 6-9 pounds. 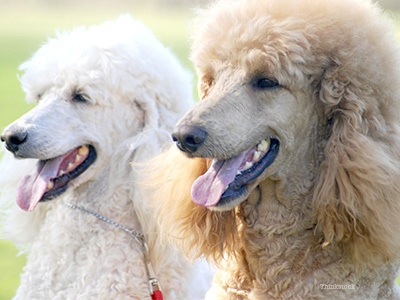 Standard Poodles live 11-12 years, while Miniature and Toy Poodles have a median lifespan of 14 years. However, some Toy Poodles can live up to 20 years. A condition that occurs when the mitral valve of the heart weakens and can no longer close properly, causing blood to leak back into the left atrium which can lead to heart failure. Poodles are brilliant. No, really: the Poodle is among the smartest dog breeds in the world! You’ll marvel at how fast a Poodle will learn new behaviors and tricks. They make fantastic service dogs, love a job to do, and are even known for outwitting their human companions. Poodles love to please people and be the center of attention. Poodles are very, very energetic, though the Standard Poodle is a bit more reserved than his counterparts. The Miniature Poodle is the most active of the three types. Consistent guidance is best: the energy and intelligence of the Poodle can make the breed stubborn at times, so you’ll have to be able to establish yourself as leader of the pack! Toy Poodles are best for older, less active people, because Toy Poodles require a lot less exercise. They are also great for folks with limited living space. They don’t do great with children, especially small ones, because like other small breeds, they can be injured by children who don’t yet know how to be gentle with animals. Miniature Poodles are energetic and need more exercise than Toy Poodles. They do well in limited living spaces, but they are a bit more to handle than Toy Poodles, so they aren’t recommended for fragile, older people. Like Toy Poodles, they aren’t recommended for households with younger children. Standard Poodles are highly active and need a lot of space – a fenced in yard is best – and regular exercise. Because of their enthusiastic, energetic personalities, and larger size, they are better around older children. All Poodles require intense grooming because of their extremely thick coats. When they shed, their fur can get tangled in the surrounding hair and cause matting and discomfort. In addition to regular brushing, the coat needs to be cut every 6-8 weeks by a professional groomer. Overall, Poodles can make great pets for the right pet parent!